Heat half the oil in a medium, non-stick frying pan, add the garlic, chilli, onions and mushrooms and beansprouts and stir fry over a high heat for 2 mins. Stir in the fish or soy sauce and transfer to a plate and keep warm. Beat the eggs until smooth with a little seasoning. Add the remaining oil to the frying pan and add the eggs and cook over a medium heat, for about 2 mins until the base is golden and the top just set. 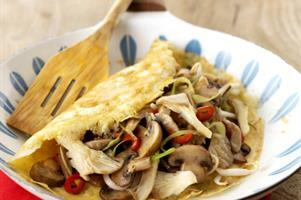 Scatter over the cooked mushroom mixture over the omelette and serve.